“I sure wish I had known about you sooner. I am a retired banker and understand the banks quite well. You are spot-on on the banks you note” - Duane R.
Welcome to all of the new CDx3 Newsletter readers who signed up during December. This is your first issue of the CDx3 Newsletter, a free monthly newsletter devoted to the interests of CDx3 Preferred Stock investors. Since the Treasury launched its Troubled Asset Relief Program (TARP) in early October I have been identifying the financial institutions that this program provides implicit protection to; if the Treasury ever wants to see their billions again these sixteen banks cannot be allowed to fail for the next three to five years (read why). In the Last Month's CDx3 Investor Results article I provide you with a chart showing the whopping 29% average increase in the market price of the 26 CDx3 Preferred Stocks issued by The Protected Sixteen banks. If you are looking to ride the recovery wave in financials, please consider these 26 CDx3 Preferred Stocks. With tax time on us once again there are a couple of tax tips that are specific to preferred stock investors. The Special Announcement article provides two tips that may save you not just money, but a lot of hassle as well. The CDx3 Company Spotlight article this month is on Public Storage, Inc. Often seen as recession proof, the self-storage industry seems to do well regardless of how the economy is doing. Like any hotel, there is a certain percentage of our population that is in between moving out of the old place and moving into the new place. As a group, we have decided to give Public Storage $13 billion in order to have a dry place to keep our stuff in transition. The 26 CDx3 Preferred Stocks issued by The Protected Sixteen banks have so much in common that you would think that they would all provide you with the same yield day-in and day-out. Each has met Treasury's "healthy institution" criteria and, as a result, received billions of Treasury investment dollars. And each has met the additional ten CDx3 Selection Criteria and all have the same, or similar, creditworthiness ratings. But their yields vary from 7.7% all the way up to 13.2%. This month's CDx3 Question Of The Month article answers the question - why aren't the yields the same too? The market prices of the CDx3 Preferred Stocks issued by The Protected Sixteen banks have shot up an average of 29% since I sounded the alarm two months ago (not to mention their 8+% dividend payments). But they're not done yet. The Market, over time, tends to equalize the yields on such investments and there is still lots of disparity to be ironed out. 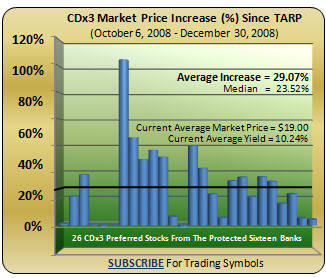 The average market price for the 26 CDx3 Preferred Stocks offered by The Protected Sixteen banks is only $19 per share. These issues have a par value of $25 per share and some are starting to exceed $26 per share. These 26 CDx3 Preferred Stocks seem to be on the tip of the spear leading the recovery in financials, but how much more can the market prices of these CDx3 Preferred Stocks climb? I will report back to you in next month's issue of the CDx3 Newsletter. For those who are paying attention, every crisis can also produce opportunity. If you are a serious preferred stock investor looking for an opportunity to invest in the highest quality preferred stocks, the unique constellation of events stemming from this credit crisis has created just such an opportunity. Make no mistake here- there is unlikely to be another set of circumstances like this again in our lifetimes. While I am as weary as anyone else of writing and reading about banks, the fact is that the Treasury's $250 preferred stock purchase program has created an opportunity for preferred stock investors that is unlikely to ever be seen again. How's That? The U.S. Treasury has essentially protected specific financial institutions for the next several years (at least three years but probably five years - read why). But the best part is, unlike prior practice, Treasury has told us, the investing public, who these banks are (see 12/29/08 list). For the last two months, I have been applying the ten CDx3 Selection Criteria (Chapter 1, Preferred Stock Investing) to this list of "protected" banks and their currently trading preferred stocks. The result is a list of just sixteen banks, The Protected Sixteen (see list), and 26 CDx3 Preferred Stocks*. Because of the special relationship these banks, and therefore these 26 preferred stocks, have with the U.S. Treasury, these 26 CDx3 Preferred Stocks* are the highest quality preferred stocks trading today. No other company, and no other preferred stocks, can claim to be in the enviable position of these 26 issues. If you are looking for a way to ride the recovery wave in financials, the research is very clear; you should consider the 26 CDx3 Preferred Stocks* issued by The Protected Sixteen banks. Market Price Still Discounted: And their average market price is still heavily discounted at $19 per share, well below their $25 par value, so there is lots of open field ahead as the recovery continues. My book, Preferred Stock Investing, teaches you how to select, buy and sell the highest quality preferred stocks and provides you with the methods needed to do so. For those who would rather receive a simple email message when there is a buying or selling opportunity coming up, we offer the CDx3 Notification Service. Subscribers to the CDx3 Notification Service receive their own exclusive newsletter, called CDx3 Research Notes, every month. 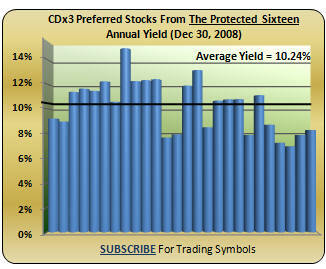 The January 2009 issue of CDx3 Research Notes provides subscribers with the trading symbols of the 26 CDx3 Preferred Stocks issued by The Protected Sixteen banks. "...Perhaps the most lucrative pockets of value are in preferred stocks of banks and financial institutions that have partnered with the government in programs such as the Troubled Assets Relief Program (TARP). While their profitability may be restricted, their ability to pay interest and preferred dividends should be unhampered." But That's Not All: These 26 CDx3 Preferred Stocks are also currently providing an annual yield over 10%. Like I said- every crisis can also produce opportunity. This is an extremely rare set of circumstances; the highest quality preferred stocks, yielding north of 10%, available at heavily discounted prices enjoying implied protection from the U.S. government for the next several years. It's Your Call: If you decide that this opportunity is not in your best interest, great. It's your call. But I would hate for you to pass this opportunity by because I had not made it clear enough to you. Not being familiar with your financial resources, goals and risk tolerance, I cannot say what is best for you; only you can do that. But when you think of the historic and extreme collection of events that it has taken for this to occur, I think it is fair to say that the 26 CDx3 Preferred Stocks offered by The Protected Sixteen banks present a unique opportunity that we are unlikely to see again in our lifetimes. If you would like to start adding CDx3 Preferred Stocks from The Protected Sixteen banks to your portfolio, please consider subscribing to the CDx3 Notification Service. The trading symbols are on page 6 of the current issue of the subscriber's newsletter CDx3 Research Notes. Well, here we go again. Time to settle up with Uncle Sam for 2008. Avoid An Amended Return: Readers who have been with me a while will remember this one. There are several layers of information needed when it comes to your broker's preparation of your 1099 form at the end of the year. The primary issue swirls around the difference between dividend income and interest income and how those definitions pertain to the income you received throughout the year from each of your preferred stocks. By law, your broker has to provide you with a 1099 form (1099-DIV and/or 1099-INT) by January 31. The problem is that in order make the proper classification of your income, your broker has to sync up with the issuers of the preferred shares that you bought and sold throughout the year, other brokers who handled the other side of your buy and sell trades not to mention the Internal Revenue Service and any rulings they may have outstanding regarding your specific preferreds. Typically, in order to comply with the law, your broker will provide you with a 1099 by January 31 but, just as typically, you will receive a revised 1099 (corrected) a few weeks later, usually before the end of February. So do not be too quick to file your tax return based on the first 1099 that your broker provides to you. While there can always be exceptions, the first 1099 that I receive each year has never been the final version. If you have already filed with the incorrect form, you will have to re-file an amended return when your broker issues you a corrected 1099 (usually in late February). "You can deduct fees you pay for counsel and advice about investments that produce taxable income. This includes amounts you pay for investment advisory services." If you are within the limitations specified by the IRS, the subscription fee for the CDx3 Notification Service may be tax deductible. Be sure to check this out with your tax advisor and make sure that you are receiving every allowable deduction. Public Storage exists to remind all of us that parting with that old lawn furniture or couch would be a big mistake. This issuer of CDx3 Preferred Stock has turned our pack-rat instincts into a $13 billion international business. Each month, subscribers to the CDx3 Notification Service receive an updated CDx3 Bargain Table (what's this?) that identifies CDx3 Preferred Stocks at a point in time that, research shows, tends to favor buyers; that is, their market price tends to be relatively low. Since Public Storage has issued several preferred stocks that meet the ten CDx3 Selection Criteria, it is not unusual when one of their CDx3 Preferred Stocks appears on the CDx3 Bargain Table as two of their issues did this month. Public Storage, headquartered in Glendale, California and founded in 1971, has diversified its business over the years to now include reinsurance of tenant property and truck rentals. They have grown their business to over 2,000 self-storage facilities providing over 126 million square-feet of net rental storage space throughout the United States and Europe. Some of this growth came from acquisitions including the $5.5 billion purchase of Shurgard Storage Centers in August 2006. Public Storage has self-storage facilities in most states. If you're finding that you just cannot part with that old dinette set, click here to find a Public Storage facility near you. Why Do Some Of The Preferreds From The Protected Sixteen Have Much Higher Yields Than Others? - Domenic V.
Annual yields currently being paid by the 26 CDx3 Preferred Stocks from The Protected Sixteen banks (see Last Month's CDx3 Investor Results article above) average 10.24%, with a range of 7.7% all the way up to 13.12%. Those are very respectable returns, even at the low end of 7.7%. But Domenic is wondering, since each of these 26 CDx3 Preferred Stocks enjoy the implicit protection of the U.S. Treasury and each meets the additional ten CDx3 Selection Criteria, why is there such variability in their respective yields? Large Portfolio Moves: There are a number of factors that can influence the market price of a CDx3 Preferred Stock (beyond perceived market risk). For example, pension funds may carry positions with banks that meet certain criteria and their positions can include both common and preferred issues. When the pension fund makes a move it affects the preferreds of one bank (the one they have a position in) but not another, even though the preferreds may be essentially the same (in terms of risk/return). Different Dividend Quarters: Also, not all banks use the same quarterly dividend cycle. The research presented throughout Preferred Stock Investing describes the Three Rules Of Market Price Predictability of CDx3 Preferred Stocks - why the market price behaves as it does under varying market conditions. As we know from one of these rules - the Rule of Buyer/Seller Behavior (Preferred Stock Investing, page 67), upward pressure on market price builds as the end of the dividend quarter approaches. If you are looking at banks with differing dividend quarters, the market prices of their preferreds are going to be behaving differently, depending upon how close they may be to the end of their respective dividend quarters. Media Treatment: There is also the influence of the financial media. In the financial press there are certain banks that seemingly can do no wrong (and maybe they, in fact, cannot). Wells Fargo, Bank of America and JPMorgan continually receive very favorable treatment compared to some of their peers; peers that carry the same creditworthiness ratings. Access To Quick Cash: Bank structure and sources of capital differ too. For example, some investment banks (such as Bank of America) also have large retail banking operations and, therefore, have access to large volumes of cash on short notice (raiding CD deposits and savings accounts, within regulatory limits of course). Investment banks that do not have a retail banking operation are always seen a bit more skeptically during tight economic times (now) as they are more depended on other (e.g. foreign) sources of short-term cash. So, while investment risk certainly is a key driver of market prices (and therefore yields) there are several other factors that influence the market price of a CDx3 Preferred Stock as well - even the 26 CDx3 Preferred Stocks issued by The Protected Sixteen banks. As described throughout Preferred Stock Investing, market prices move in response to factors other than risk. It is this fact that gives subscriber's to the CDx3 Notification Service an investment edge when it comes to investing in the highest quality preferred stocks - CDx3 Preferred Stocks. Thanks to Domenic V. for the great question. You will receive a free copy of the CDx3 Special Report "Dividend Accounting." The 17-month long credit crisis has shaken our financial system and everyone who is invested in it (which is just about everyone). Even though the CDx3 Selection Criteria, day after day, have successfully filtered out every failed bank for over a year now, and even though there has not been so much as a missed dividend for those who have invested in CDx3 Preferred Stocks, there's still some anxiety. Whether market prices are driven down by uncertainty related to war (2002) or by a global credit crisis (2007/08...), the market prices of CDx3 Preferred Stocks behave in certain ways at certain times. The Protected Sixteen Have Bounced Off The TARP; What Happens Next? For the last two months I have been focusing my writing on Treasury's TARP program and the unique opportunity that it has delivered to preferred stock investors. This program is driving the market for the highest quality preferred stocks as I have described for you over the last two months. I think we can all agree that a market price jump of 29% since I starting ringing the bell in October is pretty hard to ignore. While it is always possible that Treasury will add more banks that meet (a) their "healthy institution" criteria and (b) the ten CDx3 Selection Criteria, it is unlikely at this point. In other words, short of acquisition and consolidation activity, I am not expecting the list of the 26 CDx3 Preferred Stocks or the list of The Protected Sixteen to change much going forward. The focus now is on making prudent purchase decisions that meet your personal financial goals, resources and risk tolerance. 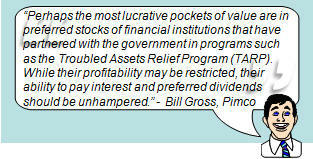 This credit crisis has provided an unprecedented opportunity for preferred stock investors via the TARP program. Will the program meet its objectives of stabilizing our financial markets and, if so, what will be the effect on the marketplace for CDx3 Preferred Stocks as 2009 unfolds?